Here we present a set of links to program sources maintained by, but not restricted to, members of CCPQ. These links will be added to over the course of the network. While the links and code packages are mainly either new to CCPQ (RMAT_REACT) or historically related to CCP2 interests, as of January 2019 the Quantics and the MOLSCAT packages below, and some links from ExoMol, are related to earlier CCP6 codes. For additional CCP6 areas and related (legacy) codes please also see the frozen archive CCP6 (we do not guarantee the validity of the CCP6 site links: a fully amalgamated set of links will appear in the future). A large number of member-authored programs are published in the Computer Physics Communications Library. Various code packages have also been maintained on CCPForge. We make no recommendation as to which codes are the "best" to use. Those in CPC are well documented, but frozen. Those maintained elsewhere are meant to be (close to) the current working versions used by the groups. Hence, in some cases little or no documentation may be available. The Tensor Network Theory (TNT) library developed at the University of Oxford contains optimised tensor operations for use in TNT-based algorithms for the simulation of strongly correlated quantum systems. Quantics implements the powerful multi-configurational time-dependent Hartree algorithm for molecular wavepacket studies of fundamental molecular reactivity. The ExoMol project calculates molecular line lists that can be used for spectral characterisation and simulation, and as input to atmospheric models of exoplanets, brown dwarfs and cool stars, and other models including those for combustion and sunspots. The project code base and associated CCPForge projects may be found on the ExoMol Software page. This code base will also be used to produce and develop a new package RmatReact for ultracold molecular collisions. UK Molecular R-matrix Group and the CCPForge sites UKRmol-in and UKRmol-out for the UKRmol/UKRmol(+) packages. The RMATRIX1 parallel R-matrix codes for electron-ion (atom) collisions and photoionization (LS/Breit-Pauli and Dirac-Fock codes) are managed by Connor.Ballance. Contact: Martin Plummer or Andrew Sunderland. PFARM is maintained on CCPForge in the project prmat-dcse and the PRMAT (including RMATRXII) inner region development tree is currently being moved to this project. We are pleased to announce the release of new versions of the MOLSCAT, BOUND and FIELD programs. This is the first full release of MOLSCAT since version 14 (1994) and of BOUND since version 5 (1993). FIELD has never been published. MOLSCAT is a general-purpose package for performing non-reactive quantum scattering calculations for atomic and molecular collisions using coupled-channel methods. Simple atom-molecule and molecule-molecule collision types are coded internally and additional ones may be handled with plug-in routines. Plug-in routines may include external magnetic, electric or photon fields (and combinations of them). Simple interaction potentials may be specified in input data and more complicated ones may be handled with plug-in routines. 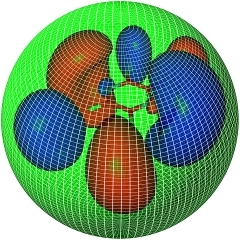 BOUND is a general-purpose package for performing calculations of bound-state energies in weakly bound atomic and molecular systems using coupled-channel methods. It solves the same sets of coupled equations as MOLSCAT, and can use the same plug-in routines if desired, but applies bound-state boundary conditions. FIELD is a development of BOUND that locates values of external fields at which a bound state exists with a specified energy. One important use is to locate the positions of magnetically tunable Feshbach resonance positions in ultracold collisions. - Atom + rigid corrugated surface: diffractive (elastic) scattering. For these cases, the programs implement both close-coupling calculations, with no dynamical approximations, and a variety of approximate methods including the coupled states and helicity decoupling approximations. MOLSCAT can loop over total angular momentum (partial wave) to calculate elastic and inelastic integral cross sections and spectroscopic line-shape cross sections. Post-processors are available that read MOLSCAT S-matrix files and calculate differential cross sections, transport, relaxation and Senftleben-Beenakker cross sections, and fit the parameters of scattering resonances. - Alkali-metal atom + alkali-metal atom in a magnetic field, including hyperfine structure. For low-energy scattering, MOLSCAT can calculate scattering lengths and effective ranges and can locate and characterize scattering resonances as a function of an external variable such as the magnetic field. Further information on the programs is available at MOLSCAT, BOUND and FIELD. The programs themselves are free software, distributed under the terms of the GNU General Public License, Version 3. Sturmian-Floquet Theory for multiphoton processes in atoms. Available from the author Dr R M Potvliege on request.